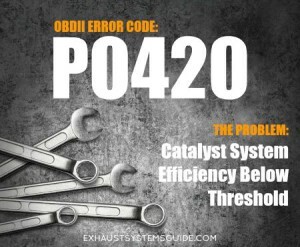 P0420 OBD-II Trouble Code: Problems with Your Catalytic Converter? When your check engine light comes on with a P0420 code, that can mean only one thing – an expensive trip to your auto mechanic. But don’t worry, we’ve outlined a few steps in this article you can take to avoid taking your car in for repairs. The P0420 error code is a sign that your catalytic converter is under performing. That could mean it needs to be replaced or just possibly cleaned. The good news is that we’ve uncovered the easiest ways to fix those catalytic converter problems so you can get back out on the road without spending a fortune. What does the P0420 OBDII error code mean? Whether you want to call them OBDII (on-board diagnostic) codes, diagnostic trouble codes, error codes or check engine codes – they all imply the same thing: you’ve got car trouble. When you receive a P0420 code it means your catalytic converter is not operating at maximum efficiency. Usually this means your catalytic converter needs to be replaced or there is a problem with your O2 (oxygen) sensors. 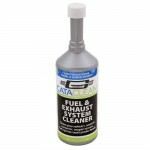 You may not notice if you have catalytic converter problems but the environment will. A catalytic converter helps reduce your car’s emissions. 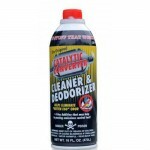 It does this by converting the carbon monoxide in your exhaust into carbon dioxide and water. If you continue driving without fixing this problem you may not pass your vehicle emissions test or smog check. Do I Need a New Catalytic Converter? But before you order a new catalytic converter online, let me give you my disclaimer: This site is for information purposes only. Please consult a qualified professional in your area if you have any questions or concerns about your check engine light. As I mentioned above, the P0420 code means that your catalyst system efficiency is lower than it should be, as measured by your O2 (oxygen) sensors. This means there may be a problem with either the catalytic converter, the oxygen sensors, or both. The 02 (oxygen) sensor is designed to monitor the fuel and air mixture in the exhaust to verify that the engine is running efficiently. Your engine control unit (ECU) will use this information to adjust the engine performance as you’re driving. 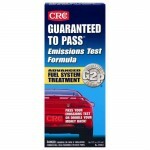 When your O2 sensors are working properly you will get better gas mileage and optimal performance. After your check engine light comes on and you verify the P0420 error code, there are a few simple steps you can take. First, you should check the entire exhaust system for any visible holes or deterioration. If the exhaust looks intact you may need to replace the catalytic converter. While it may not be necessary, you could also replace your O2 sensors while you’re under there. That way you don’t have to do it later down the road, if they are in fact damaged.